If you want to see how truly valuable of an asset you are to the United States military, volunteer on base. There are endless opportunities to get involved doing something you love and with a schedule that works for you. After having the opportunity to volunteer on two bases, I have gained a love of military life I didn’t think I’d ever have. The people I have met and the experiences I’ve had have shaped me in so many ways. Through giving, you’ll find you gain so much more than just adding volunteer hours to your resume. 1. Meet your neighbors. I have actually met my neighbor while volunteering at a front desk. Volunteering on base gives you more opportunities to meet people who are stationed where you are. You can make connections, make friends and get to know the people around you better. 2. Put your skills to work. One of the drawbacks of moving often is that we are sometimes unable to really work in the field about which we are truly passionate. Volunteering allows us to not only choose what we want to do, but also make connections with people in that field to learn more about how to pursue what we love in the location where we’re told to live. 3. Learn about military life. I learned most of what I know about the military and military life in general from volunteering on base. You will learn acronyms you didn’t know existed, proper procedures and how to handle difficult situations when they arise. Coming from a world where I knew little to nothing about the military, this was an invaluable way to learn about military life around me. 4. Fill the gaps. Maybe you have parts of your resume you would like to improve. While this should not be your sole purpose for volunteering, it can be a great way to learn skills that can make you more appealing to employers if you are on the job hunt. If you are new to a base or between jobs, it can be a great way to remain actively involved. 5. Make it work for you. Yes, you can still volunteer while being employed. The volunteer coordinators will work with you to find opportunities that you will love and that will work with your schedule. You can volunteer all day, every day or two hours a week. It is entirely up to you. 6. Find your appreciation for this life. There are so many fantastic resources and experiences available to military members and their families. We truly look after our own. It is great to be able to let others know what you have learned about these amazing programs so that they can take advantage of them if they need to. 7. Find a new passion. I did not think I would enjoy working in civil service until my time spent at Army Community Service. Volunteering on base will push you out of your comfort zone in the best way possible. You might foster a passion you never knew you had. 8. Build your network. It can be hard to build a strong community and network when you move to a new base. That makes seeking employment a challenge. Volunteering opens the door to the community around you. You are able to make connections in the areas in which you may want to build a career. Volunteering is a great way to meet those who might be able to help you jumpstart a career that you will love. 9. Join the party. One of the many complaints of military members and their families is that they cannot find things to do where they are stationed. Many organizations on base will host events that are fun for all ages and backgrounds. Unfortunately, some of these organizations are not great at publicity. Volunteering immerses you in the community. The more involved you are, the more likely you are to hear about these events and be able to tell others. 10. Do your part. Our military members have given so much of themselves for the safety of our nation. There are multiple ways that we can show our gratitude and volunteering is one of them. You may be the one smiling face a military member sees that day. 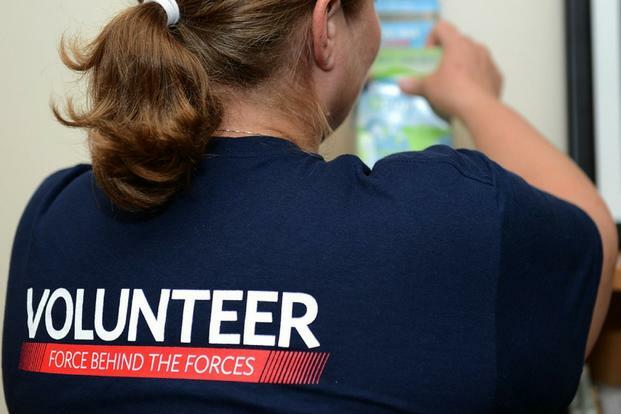 As a volunteer you have the power to make a positive impact on our military community. We can make this experience better and this community stronger.